When Evans Tan moved to Wellington last year from Singapore to study at Victoria University, the support of his kiwi buddy, organised through the Victoria International Buddy Programme, helped him settle into life in a new country and culture—now he’s returning the favour. 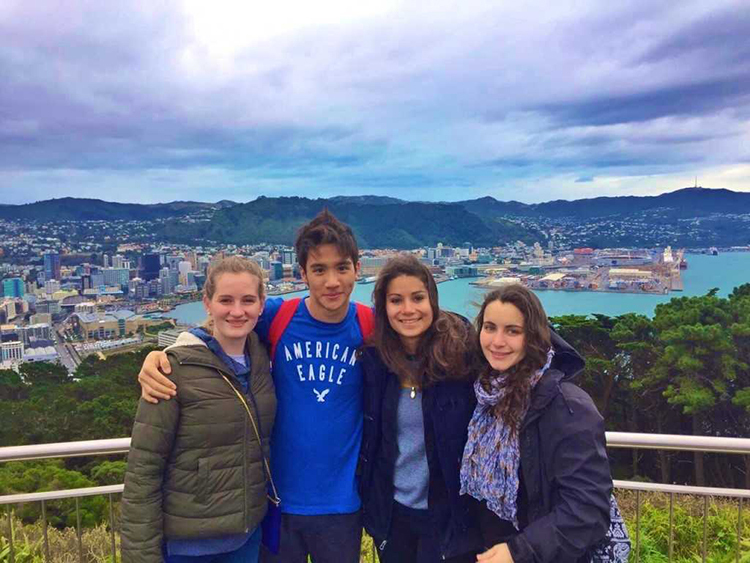 Evans (second from left) and friends from the Victoria International Buddy Programme at Mount Victoria Lookout, Wellington. Setting foot in a new country was never going to be easy. I’d never been to New Zealand before, so I had a lot of questions before I arrived—‘What do I need to bring? What do I need to wear?’ (I had no clue about Wellington weather). To help me answer these questions, and more, was my buddy from the Victoria International Buddy Programme. Each trimester, the International Buddy Programme pairs new international students with current Victoria University students who can help share their local knowledge and make arriving students’ introduction to New Zealand a little easier. Before I’d even landed in New Zealand, my buddy and I were able to exchange emails, giving me the chance to ask any questions, which eased my anxiety and helped me to prepare for my trip to a new country. When I arrived, I had the chance to meet other new international students through activities organised through the International Buddy Programme—this was a real highlight of the programme for me. I really enjoyed interacting with other international students, sharing my own culture and learning about different countries and cultures too. This helped me to broaden my world view and forge some great friendships. After having a buddy for my first trimester of study, I realised how much of a difference this had made to me when settling into Wellington and Victoria University, so I decided to become a buddy for a new international student the next trimester. I love helping people, and I really enjoyed introducing my buddy, Timme, to Wellington and sharing my local knowledge. Most importantly, I enjoyed his company! The International Buddy Programme has given me the opportunity to see the world by making connections with different people and gaining new perspectives. I’d highly recommend this programme to anyone who is interested in building strong international friendships. You can get involved in the International Buddy Programme by registering online to become a local buddy, or as a new international student who would like to be paired up with a buddy. Evans Tan is a second year arts student majoring in Education and Psychology.